DiEM25 flagging up the new series in The Guardian.DiEM25. All rights reserved. We argue that the world entered a stage where the crisis of the different geographies has a common root: social and political injustice. That is why, the call for a new international is extremely necessary in today’s world. On the one hand, people are exposed to the increasing anxiety, anger, isolation and the precarity in their everyday life: on the other hand, they suffer from the lack of mechanisms to participate in the decision-making process and political freedom. Even in the advanced democracies people are now exposed to the increasing authoritarianism accompanying the rise of right-wing populism and emergence of autocratic leaders. Here, a need for political action emerges. As an important tool of this political action, a progressive international can energize the left and progressives around the world. But the question is what should be done to mobilise this? In what domains could this progressive international seek to intervene? How can progressives be organized? What are the limitations? Whose demands and what functions will be articulated and represented by this new international? First of all, we need a diagnosis. The program and discourses of the new international have to respond to the changing relations of production of the twenty-first century. The class structure is not the same as in the twentieth century. Now, throughout the world, as Yanis Varoufakis outlined in his manifesto, a new class is burgeoning: the precariat. Hence, we can argue that the global conditions and demands of the precariat have to be represented by this new progressive international. Today, precarity is a global phenomenon across borders, from the US to China, from the UK to Sudan. In each part of the world people suffer feel more precarity than ever, leading to a sense of aimlessness in life and uncertainty about the future. The same questions arise: “Why do I work?”, “Why do I try to find a work?”, “Do I work all day and then relax with Netflix in the remaining hours left to me?”, Will I be fired if I do not agree with my boss?”, “How can I pay my debt without a proper job and a home?”. These kinds of questions plague people, leading to anxiety, fear and anger. As Paul Virilio put it in Libération in 2010, all these feelings are globally common. We, as Turkish political scientists, observe the same phenomenon in Turkish society as well. Thus, the violence of uncertainty in everyday life strongly affects our capacity for humanity. Furthermore, the fate of individuals and societies around the world are becoming increasingly common. Precarity does not recognize borders, nationalities, religions or deep-seated ethnic and racial prejudices. Precarity and its consequences are global. This makes the precariat a new global class. However, this class needs political representation and social power. Can the Progressive International be one way to do this? But enough diagnosis. What global action can be expected to emerge from all these global feelings? Political-economist Wolfgang Streeck argues that the institutions that can act at the global level are those like the CIA and Goldman Sachs. Therefore he urges progressives and leftists to “think globally and act locally”. However, we need more than that. In the first phase, the progressive international may be prevented from acting at the global level, due to its lack of organizational capacity. However, from the beginning it has a serious responsibility to increase the awareness and visibility of our common fate and feelings. This awareness and international solidarity would help progressives around the world to challenge neoliberals and neo-fascists. In the lack of alternative ideals and future, ordinary people lose hope and may be prone to supporting neo-fascist movements. But if the progressive international reminds all these people that they are in fact experiencing the similar conditions of a social class, the precariat, an alternative ideal and future can emerge. Thirdly, we believe that this international movement cannot limit itself to western Europe and north America. Precarity and the precariat are global and people are bound to each other everywhere. Even if this international proves successful in western Europe and north America, its gains will always be at vulnerable to the extreme inequality and injustices experienced in more remote parts of the world. It should be underlined that neo-fascism is strengthened from the flow of immigrants escaping from unjust and unequal conditions. The problem is neither solely neoliberalism nor neo-fascists, but both. This is why the Varoufakis-Sanders international recognizes as its enemy the alliance of neo-liberals and neo-fascist governments around the world everywhere. The world needs both political and social justice to effect progressive change. However, the precariat cannot transform the world on its own. It needs support from the members of other social classes including plutocrats, political and financial elites. Karl Polanyi says the determining factor of the success of a social class is the support coming from other social classes. We accept that it is not simple to get support from others. Though, the more power the precariat gains, the more support they will get from other classes too. The Progressive International has to strive for this. Furthermore, the Progressive International should provide a multi-strategy for different contexts. Although social and political injustice is a global phenomenon, different countries suffer from these in varying degrees. In the middle of Europe, populist governments violate the principal institutions of democracy: freedom of the press, freedom of expression, the rule of law, even fair and free elections are under threat. Thus, people cannot find a space to raise their voices especially if they are ruled under authoritarian governments. So in this global movement, progressives have to consider the historical, political and social contexts of specific countries to mobilize the masses. Putting social justice claims forward by shadowing political justice issues in countries such as China, Turkey, Hungary and India may be the most effective way for progressives to operate in these countries thanks to the high degree of political polarization. Finally, how can members of the precariat organize themselves? The answers to this question do not come easily and this makes the calculations of the Progressive International necessarily a long shot. It is a topic for a future article. But let us explain as clearly as we can: there is no victory without sacrifice. Every one of us, the precariat, already pays a high price in political and economic sufferings. In this time that is coming, at least let our suffering be for an ideal: the transformation of the world into a just place. 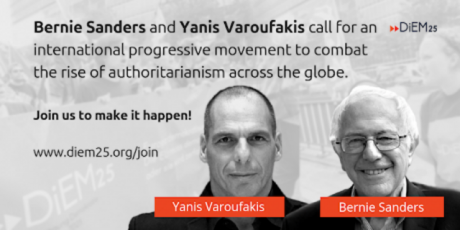 In a nutshell, the Varoufakis-Sanders joint initiative is a very timely move. It needs global support especially but not exclusively from progressives around the world. While neo-fascism continues its shadow boxing with neoliberal capitalism, progressive ideas need to make their own argument at the global level and fight for ageless ideals: equality and freedom!